I know there are some other apps out there just like this, but this is FREE! I did not have this on my class iPads, but I use it daily and could see it being used a lot by kids in class. 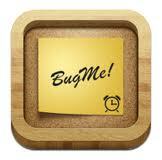 It is like typing on the note pad, but it helps you create a "sticky" note right on your home page of your iPad. Once the note is created, Bug Me will tell you to open it in Safari. Once you do that, you just add to your home page. (In tool bar of Safari, touch arrow coming out of square button, and then click on "add to home screen). You then have a sticky note to create to do lists, notes, or any type of reminder. Just hold down and delete when you are finished!